To inquire about photo usage and fees click the Image Inquiry link, or contact us. High Quality Prints may be ordered by clicking the BUY PRINT link. Search Photos via Category Tree, Image Search, Marine, Terrestrial, or Image Galleries. This is a Rights Managed image. Image Description: Coffin Ray (Hypnos monopterygium). 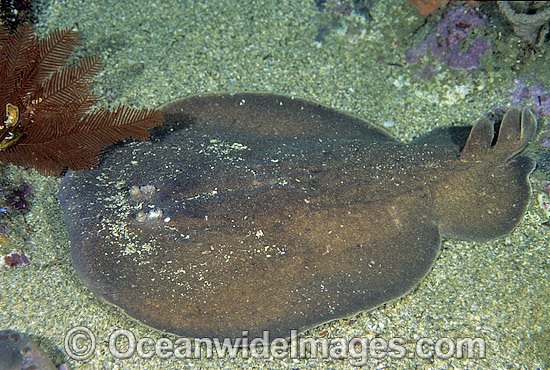 Also known as Electric Ray, Crampfish, Numbfish, Short-tail Electric Ray and Torpedo Ray. New South Wales, Australia. This ray is capable of delivering a strong electric shock and uses its electric organs to stun prey. All of our Stock Photos are available in High Resolution and taken by Professional Photographers. Images are available to License for your publication or you may purchase a High Quality Print. .
Search for more images via the Search box above or Category Tree to the left. If you cannot find the image you are looking for or would like to make further inquiries, please contact us. COPYRIGHT NOTICE: This Rights Managed image is fully PROTECTED by International Copyright Law. It is NOT a Royalty Free image or Public Domain image available to the general public. Use of this image without purchasing a usage license from OceanwideImages.com constitutes a violation of Copyright Law. Registered businesses, companies and Government bodies may use this website image with watermark displayed for in-house comprehensive layout (Comp) free of charge until a decision to license the image is made for the actual intended commercial use. Larger Comp images without the water mark are available upon request - please contact us with the image numbers.